A new cycle for Sword & Sorcery is coming with Ancient Chronicles, now on Kickstarter. Ancient Chronicles will be a new starting point to the game, suitable both for newcomers and for players who are already playing the game. For those arriving now, we present an overview of the game system. 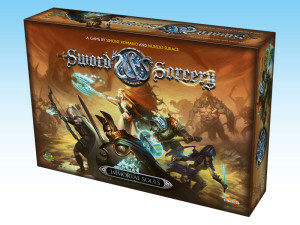 Sword & Sorcery is a fully cooperative fantasy board game in which the players become heroes who must explore dangerous ruins, ominous forests, and besieged cities to not only save their country, but to gain back their very souls, shattered by the resurrection spell. 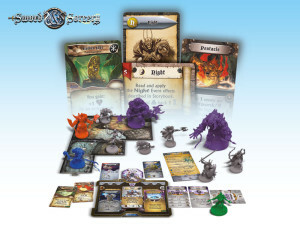 The first campaign, Sword & Sorcery Immortal Souls, was funded on Kickstarter in November 2015 and released worldwide in July 2017, followed by several expansions, including campaign sets, hero packs, and accessories. Immortal Souls: core set of the first season of Sword & Sorcery cooperative fantasy game. Sword & Sorcery brings countless hours of high adventures and quests, as the heroes battle their way against evil hordes, shaping both the future of Talon and their own destiny. They fight through quests, linked in a campaign. Each quest pits the heroes against traps, monsters, and mysterious powers. Not only will the characters have to make their way with steel and magic, but they must also face moral dilemmas and choose between Chaos and Order, or the dangerous path of Neutrality. Heroes’ alignment influences the adventure path and the powers the heroes themselves wield. As the heroes grow in power, their souls return to them, bringing forgotten memories and new abilities, and enabling them to stand against the most powerful foes Evil wields against them. 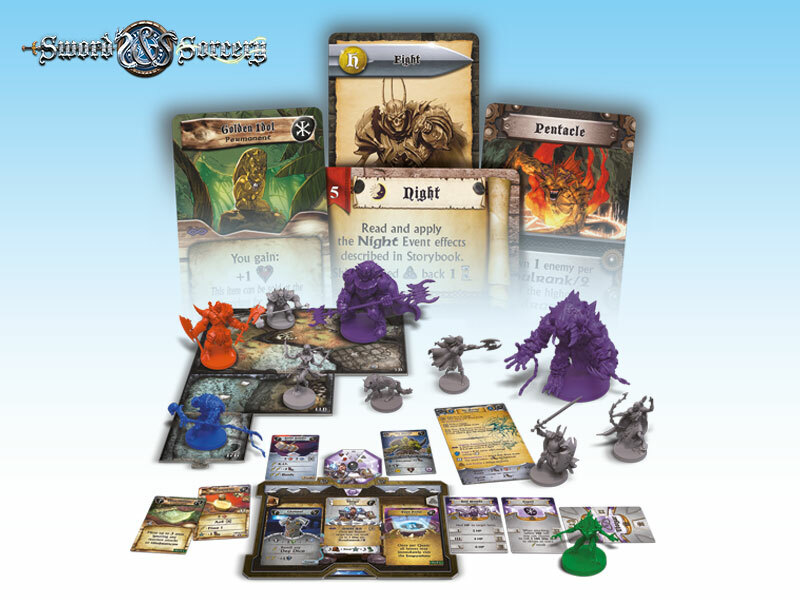 A view of miniatures, cards, map tiles and other components of the first set of the game. The forces of Evil are controlled by the A.I. system of the game. Each enemy has different fighting styles, multiple behaviors, weapons, and additional powers, and is represented by a miniature. 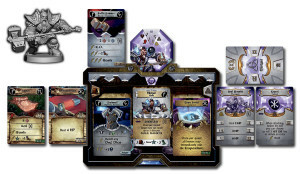 The game mechanics control monsters and traps through several decks of cards: Enemy cards detailing the enemy; Enemy Power cards defining special powers the enemy may possess; Enemy Scroll cards describing the A.I. 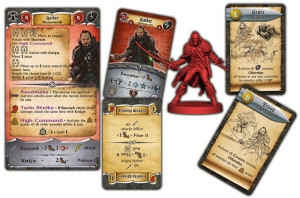 for each enemy (including movement, combat behavior, and favored enemies); and Encounter cards dictating which enemies act in the upcoming turn. An event system, controlled by Event cards, tracks the passage of time and activates special events and encounters. Monsters are not the only danger: traps (controlled by a Trap deck) may spring from doors or chests. Risen from their graves due to a powerful summoning spell, the Heroes of Sword & Sorcery are no mere mortals. They are born again, vestiges of ancient and powerful champions who battled to protect the world from an ancient and terrible Evil. To battle they went, and in battle they fell, one by one, until no hero remained on the face of the land. 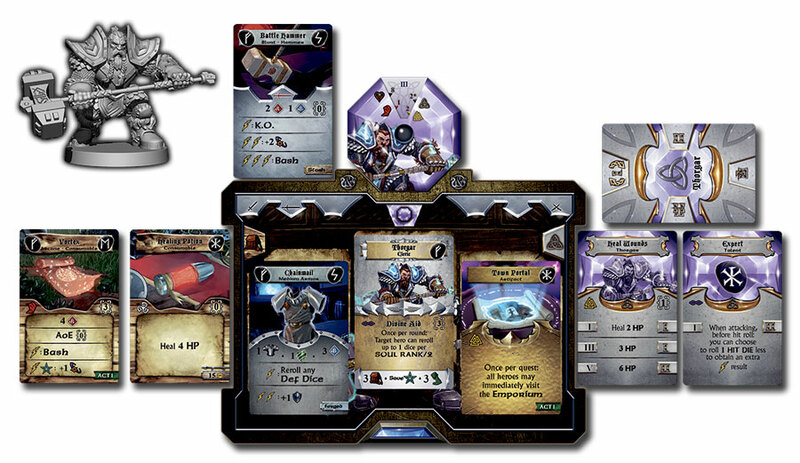 Miniature, hero sheet, soul gem, and a number of power and equipment cards represent the heroes in the game. But the sacrifice has been made, the ritual performed, and five mighty champions of goodness rise to fight another day. Unfortunately, the resurrection spell was too weak to summon the Heroes’ souls as a whole; therefore, each Hero must strive not only to once again oppose the ancient Evil, but also to regain his very soul, dispersed and intertwined with the evil forces infesting the land. As they fight and vanquish enemies, the Heroes of our story gain back pieces of their lost souls, regaining memories and incredible powers to use in their endless quest. Each Hero can be chosen to represent either the forces of Law or Chaos, although some Heroes (Laegon in the retail set) are Neutral. So, each Hero has two “basic configurations,” with different powers and abilities, opening the way to different strategies to play. The heroes are not alone in their quest. They find allies and can empower themselves by destroying enemies and solving puzzles. As their soul shards return to them, the heroes acquire new powers and abilities, detailed in special decks of cards, one per hero. Some powers, however, may only be chosen if the hero has the proper alignment. Heroes can also loot monsters and chests for treasure, equip themselves with new weapons and armor (which can be upgraded at the Forge), buy or sell items at the city Emporium, or keep items in their secret stash. Components of the Enemies game system. As always happens when an evil power is unleashed, many lowly wicked creatures crawl to its banner, and many powerful enemies join the unholy cause. The world of Sword & Sorcery is no exception. In Sword & Sorcery, enemies can have three different Ranks. The green enemies are the least powerful rank-and-file, hardly a challenge to the heroes except when in large groups. 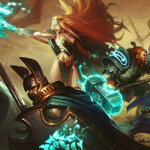 The blue enemies are stronger, and a match for most heroes, as they are more than capable of inflicting serious damage. Finally, the red enemies are the strongest type: powerful attacks and strong resistance are usually coupled with special abilities making these opponents a match for even a battle-hardened group of heroes. There is a fourth type of enemy: the purple Master enemies. They are unique, extremely powerful opponents. Heroes will not face this kind of enemy in every adventure, as they are the true leaders of the evil forces, or very special creatures summoned at a great effort for the dark cause. The combat system in Sword & Sorcery is fast and deadly. It is based on special, custom 10-sided dice that come in two different colors, red and blue. 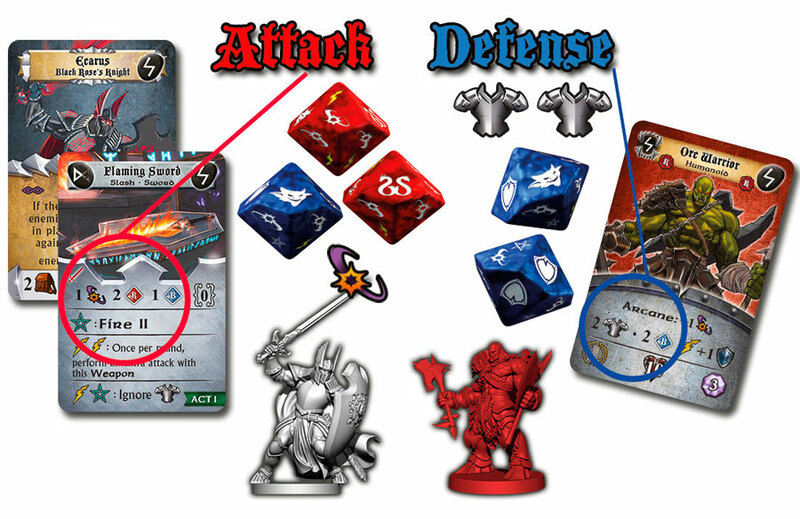 The red dice are used during attacks only, while the blue dice are used for both attack and defense. The dice are marked with special symbols instead of numbers, and each symbol has its own meaning during a fight. Combat system in Sword and Sorcery. When a hero or a monster uses an activity to Attack a target, the combat rules come to life. An attack can be performed with any hero’s equipped weapon, power or item (or a weapon or natural weapon, per the monster description). All weapons have a Range: if the range is 0, then the weapon can be used only to attack targets in the attacker’s area; otherwise, the weapon can attack targets in Line of Sight and range of the weapon (weapon ranges are measured in areas). There are two stages in any attack in Sword & Sorcery. The first stage is called the HIT stage and represents the attempt to hit the target. The HIT includes three steps: roll a number of red and/or blue dice based on the weapon, power or item used and any other bonus or penalty, apply any special effect (such as a bolt or a pentagram) shown in the dice, and summarize hits - adding up all hits inflicted with the roll, including all bonuses, special effects, special actions, and so on. At this point, the HIT stage is over, and the DEFENSE stage begins. It includes six steps, based on the defender’s characteristics and abilities that can reduce, increase or cancel the total number of hits calculated in the HIT stage: Weaknesses and resistances, Armor, Magic shield, Roll a defense dice for each uncancelled hit, Apply special defensive effects of items or creatures, summarize shields - calculate the total number of shield icons rolled and cancel one hit for each shield. Each unblocked hit at the end of this step reduces the defender’s current Health Points total by 1. In Sword and Sorcery: Immortal Souls, the first campaign using the game system, the land of Talon Coast is helpless after centuries of bloodshed and war, with the last heroes fallen on the battlefield. Evil is on the move again, and the armies of darkness surge forward, threatening to extinguish the very light of the sun. But there is one last bastion of hope: Claudius, the High Priest of the Temple of Heavenshine, sacrifices the holiest relic of the land to summon back the fallen heroes to life. Weakened by their own resurrection, yet determined to return hope and justice to the land of Talon, the reborn heroes will wage war against the scheming evil in its many hideous forms. The storyline of Ancient Chronicles, the second season of the saga, is a prequel to the adventures re-enacted in Immortal Souls, set in a not-so-distant past of the events narrated in the first campaign. In the next article, learn more about this new cycle of Sword & Sorcery and the new elements it will introduce to the setting.